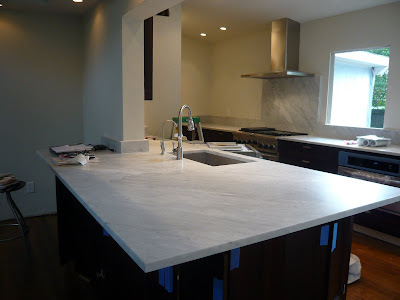 I've been working on this job for the last couple of months and the marble counters went in earlier this week. This is Carrera marble with a honed finish and it's turned out really well. I have to say that I've never seen Carrera this beautiful so kudos the Rick and the Gang at Custom Marble in Tampa for finding the slabs this counter was made from. This Carrera has veins of a taupe color in it and it reminds me of its sister stone, Statuary marble. To give you an idea of the scale of this counter, the peninsula in the foreground is made from a single, whole slab. That's a pretty big counter. I think it's all beautiful and my homeowner's ecstatic about her renovation. There's a chunky stainless steel shelf going on the wall to the left of the hood, so that corner won't be as out of kilter as it looks now when it's completely done. The contractor's goal is to be out of there by Christmas, so if the stars align for him I'll have some photos of the completed room next week. The cabinetry is a non-beaded inset door with an exposed, black final hinge. I used cherry with a really dark stain called espresso. The cabinetry came from Medallion's Platinum line and if you go to their website, the door style is called Craftsman. Here's the door in a light-stained oak so you can see the details of it. I loved using this traditional door in a nontraditional and clean way. All around, I'm pretty keen on this room and it's as close to something I'd want for myself as I've worked on in ages. But man! I wish I would have found out about those Bocci 22s in September when this whole thing started. Very nice. This is going to be so sharp when all done. Good job! Thanks! I'll get back in there for some better shots before it's all said and done. I want them for my book and unlike a lot of my projects, I'm really dying to see it completed.